In a stunning turn of events, America has informed Brett Favre that it is “moving on” from the once-beloved icon of sports. Favre, the Minnesota Vikings’ first string quarterback and a lightning rod for ugly controversy, was informed of America’s intentions late Monday night, December 28th, after his team fell in overtime to the Chicago Bears at Soldier Field in Chicago. Said America, “Brett, I can’t even remember why we got together anymore,” adding that “that was a long, long time ago when [America and Favre] were much younger” and most likely, “a pair of fools in love.” At press time this morning, Favre was reported to be sleeping off a “pretty decent” hangover on the sofa, America apparently having kicked him out of the bedroom. “What’s left to say about Brett that hasn’t been said? Is he a legend, sure. Is he still a competent QB at this point in his career? Possibly. But what he most definitely is is a man who has walked out on his commitments to two adoring fan bases, blasted and manipulated both local and national media contingents, thrown three professional head coaches under the proverbial ‘bus’ in three years, and tossed enough dumb picks in critical situations to merit his own ‘Greatest Moments in Interception History’ montage in Canton [home of the NFL Hall of Fame]. Of course, all of that might have been forgiven if the guy could’ve set aside the whining, the controversy, and the Wrangler Jeans ads and – for the first time in, what a decade? – won a competitive football game in December or January. I mean, seriously, facts are facts. America is ungrateful and will regret dumping Brett, especially now, when he really needs America the most. America is, by any measurement, a total ‘doody head’. Brett loves and admires America and if America would just understand that he doesn’t really mean it when he gets angry at America — he’s just an emotional guy and that’s how he shows that he cares. 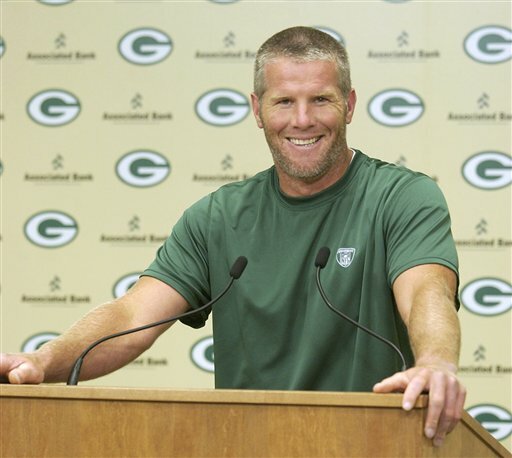 No one had a problem with Favre when he was a twenty-something drug addict, so what’s the problem now? Someone – and really, who else? – has got to let dads all over America know that Wranglers are the most comfortable and affordable denim trousers on the market. In related news, sources within the Vikings organization report that Favre won his NFC Central Fantasy Football league by starting Jay Cutler on Monday night. Evidently, “Brett just had a feeling that Jay was going to be on form” against the formerly formidable Vikings defense. This is an idiotic article and a complete waste of time to read. It’s a bunch of nonsense that means nothing and this person wrote possibly to get a pay check — I hope not. He should be in the unemployment line. it was a fake story,guys. thanks for the read. Favre’s year in stats 2009. That is 7 int’s on the whole year! Favre’s best year ever. That stats by themselves prove your are an idiot! That said, this was a fake piece of journalism. It was a satire on the way the game is reported. Thanks for the read.